The Historic Tennis Club in Palm Springs, CA. The Tennis Club is a charming neighborhood that has the distinction of being one of the oldest in Palm Springs and possesses a true sense of community. The Tennis Club’s eclectic mixture of 240 single family residences, several condominium properties, over 25 small boutique hotels and restaurants serve to give this neighborhood a true village feeling. 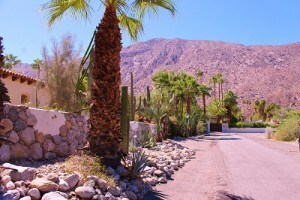 Its location is just steps away to Palm Springs’ exciting and alive downtown area. Many of the properties remain surrounded by rustic stone walls and there is even said to be an Indian burial ground here. The prestigious Tennis Club which this neighborhood was named after was founded in 1937 by Pearl McCallum McManus. She is known as the person responsible for bringing Mid Century Modernism to Palm Springs by incorporating this architectural style into the Club’s design and layout. Spanish and Moroccan style homes were also built in this community, giving the Historic Tennis Club its charming eclectic ambiance. There are eleven structures located within its boundaries which are on the historic registry. Though living in the Tennis Club gives one the feeling of stepping back in time, it is conveniently located just a twenty minute drive away from the Palm Springs International Airport and Interstate 10, making travel outside of the valley easy and accessible. The Tennis Club’s charm is its eclectic mix of 240 unique homes along with small hotels, restaurants, etc. Residents ardently guard its historic character and livability and the Historic Tennis Club Neighborhood Organization was started for just that reason – to maintain and promote the diverse and unique architectural design and the tranquil desert environment that characterize the current lifestyle and quality of residents living within its boundaries. If you’re seeking a community oriented lifestyle and love the magic of old style Palm Springs, then the Tennis Club would be a perfect fit. Recent Condo HOA: Tennis Club 400 West – $200/mo. ; Tennis Club 500 West – $300/mo. People who like Historic Tennis Club also tend to enjoy Old Las Palmas , Vista Las Palmas, The Movie Colony and Little Tuscany.